When I dream of flowers, I imagine an loosely structured, hand tied bouquet made of a single white flower. 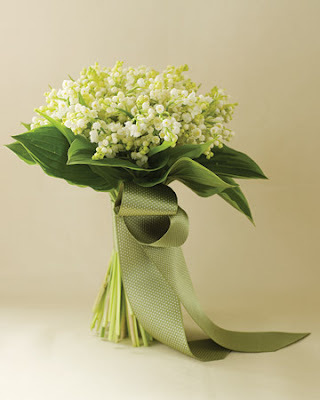 Tea or garden roses, peonies, hydrangeas and even baby's breath are gorgeous, but it's hard to deny the beauty of lily of the valley. Sold on the streets of France on May 1st (the day of my master's recital), Christian legend tells us that lily of the valley was the result of Eve's tears as she and Adam fled the Garden of Eden. I'd happily leave the Garden of Eden if it meant a lifetime of apples and John, and lily of the valley would be a perfect flower to carry down the aisle to him. Photo c/o Martha Stewart Weddings.